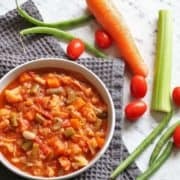 A cannellini bean soup filled to the brim with vegetables – healthy, delicious and comes together in flash. Perfect way to use up any veggies about to turn in the crisper. This cannellini bean soup is a much loved recipe in our family. It’s our default dinner whenever we have a bunch of random vegetables that need to be used up or after an overly indulgent weekend when our bodies are singing out for anything with nutrients. It’s been sitting at the very back of the blog archives since January 2017 and was one of the very first recipes I published. The photos didn’t do it justice, and it deserves its day in the sun. So I’m bringing it back today. Feel free to make it your own by adding whatever vegetables you have on hand. I have a feeling this recipe will find it’s way into your families favourites as it has ours. Olive Oil – OR you can use coconut, grapeseed or whichever cooking oil you prefer. Cannellini Beans – Even though it’s technically not a cannellini bean soup without the cannellini beans, you can substitute for another bean if you’d prefer. Green Cabbage – OR you can use savoy cabbage if you’d prefer. Cauliflower – OR throw in whatever veggies you have on hand. Italian Seasoning – If you don’t have pre-mix on hand you can just use a mix of Oregano and Thyme. Cayenne Pepper – OR you can use chilli flakes if you’d prefer. Heat oil in a large pot over medium heat. Add onion, celery, carrot and garlic and cook, stirring for 3 minutes, until the onion is soft. Add cauliflower and cabbage and continue to cook, stirring, for 1-2 minutes. Add stock, diced tomatoes, cannellini beans and season with Italian seasoning, cayenne pepper, salt & pepper and stir to combine. Bring to boil and let simmer for 20 minutes, or until vegetables are cooked. Serve as is or with some crusty bread. Enjoy! Select saute mode on IP or pressure cooker. 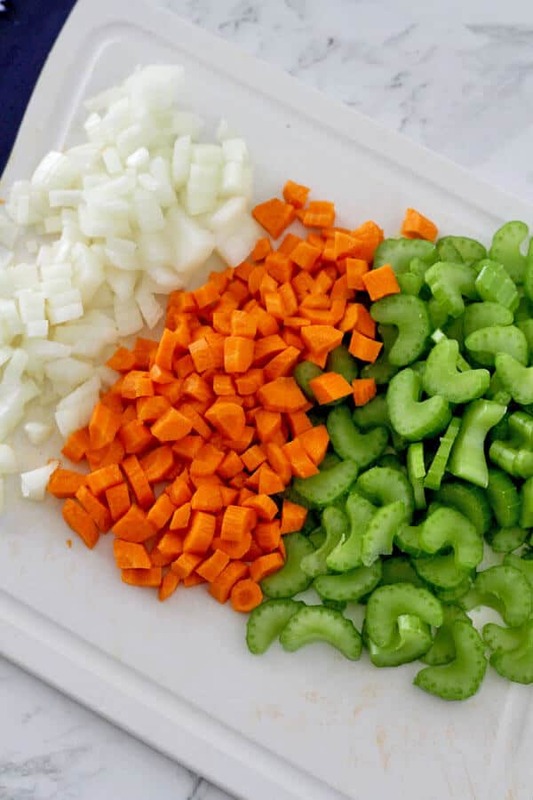 Heat the oil, then add onion, carrot, celery and minced garlic and cook, stirring regularly, for 3-5 minutes. Add everything else in the IP or pressure cooker. Set to high pressure for 20 minutes. Release the steam. Let the soup rest in the IP or pressure cooker for a few minutes to allow it to thicken slightly. Serve as if or with your favourite toppings (parmesan, crusty bread etc) and enjoy. Store in an airtight container in the fridge for up to 4 days, or in the freezer for 3 months. 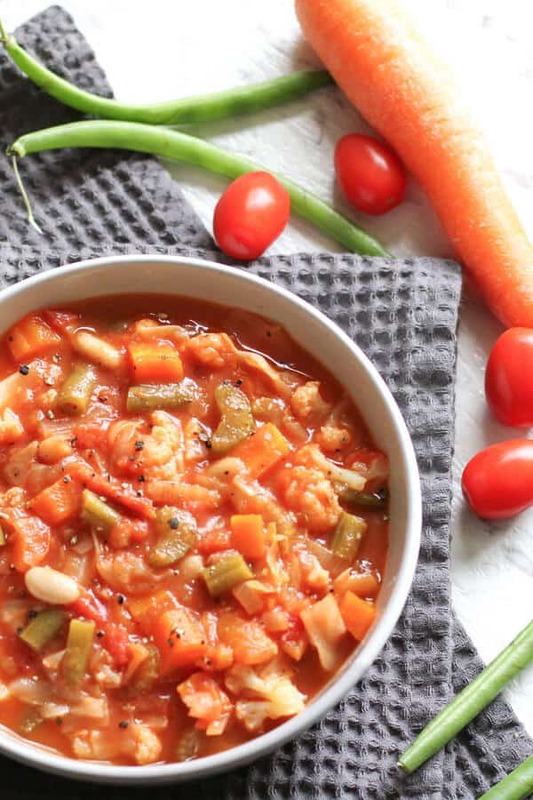 If you’ve tried this Cannellini Bean Soup I’d love to hear how you enjoyed it! Pop a comment and a star rating below! You can also FOLLOW ME on FACEBOOK, INSTAGRAM and PINTEREST. 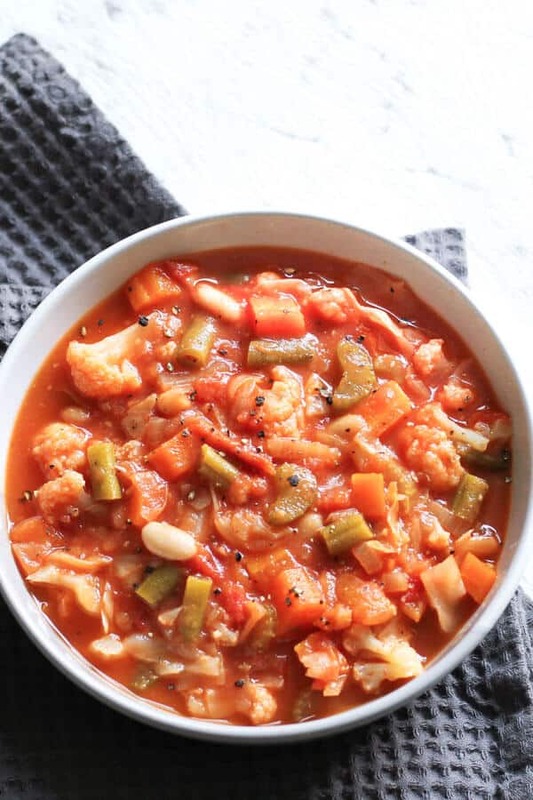 A cannellini bean soup filled to the brim with vegetables - healthy, delicious and comes together in flash. Perfect way to use up any veggies about to turn in the crisper. Add stock, diced tomatoes, cannellini beans and season with italian seasoning, salt, pepper and cayenne pepper and stir to combine. Serve as if or with your favourite toppings (parmesan, crusty bread etc) and enjoy. Olive Oil - You can use coconut, grapeseed or whichever cooking oil you prefer. Cannellini Beans - Even though it's technically not a cannellini bean soup without the cannellini beans, you can substitute for another bean if you'd prefer. Chicken Stock - You can use vegetable stock if you'd prefer. Green Cabbage - You can use savoy cabbage if you'd prefer. Cauliflower - OR throw in whatever veggies you have on hand. Italian Seasoning - If you don't have pre-mix on hand you can just use a mix of Oregano and Thyme. Cayenne Pepper - You can use chilli flakes if you'd prefer. STORING - Store in an airtight container in the fridge for up to 4 days, or in the freezer for 3 months. NUTRITION - Nutrition information is a rough estimate based on a single serve. Last Updated: March 20, 2019 – no changes to the recipe, just updated with more photos, tips and tricks.